In Santa Barbara area, today, this weekend, is the time to plant your bareroot strawberries you have had chilling in the fridge! If you just can’t do it now, do it before the 10th at the latest! If you miss this window, wait until next spring, then plant transplants. 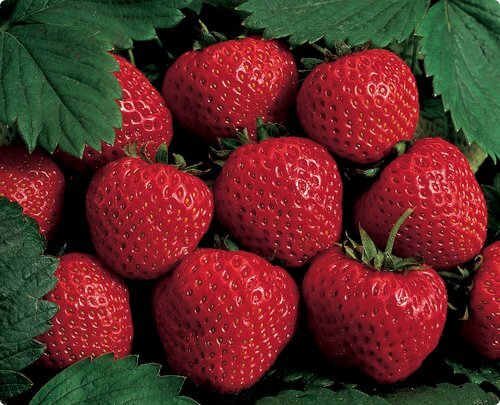 8 medium-sized strawberries contain 140% of the U.S. RDA for Vitamin C. Bet our fresh organic ones have more! Here is what some people think about bare root: Bare root in simple terms, means a savings to the consumer of 40 to 60 percent, and in many cases a more vigorous specimen. With bare root planting, roots grow directly into native soil – the same soil they will remain in during the plant’s life-span. Hence, no transition, and no dissimilar soils. Containerized soil is sometimes too adverse for its to-be-planted environment. Roots may refuse to absorb moisture from surrounding soil. These adversities can cause death or slow root growth. And they don’t use a plastic container. However, most of the commercial literature online leans toward planting from ‘plugs.’ Advantages of plugs: not exposed to plant pathogens, earlier fruits, need less water to get started, it’s not critical to get your plants in the ground the same day or ASAP. It’s best to buy varieties that are known to do well here locally. Our local nurseries carry those. Planting time is critical. Studies by UC Ag Extension paid for by growers, have proved that berries planted between Nov 1 to 10 get winter chill at the precise moment in their growing schedule to trigger fruit production rather than foliage. When planted at the wrong time, they put out runners but little if any fruit. Our local (Santa Barbara) growers plant Nov 1 – 5. If that changes due to weather patterns, plant when they plant. Deciding on whether to plant June Bearing, Everbearing, or Day Neutral strawberries depends on your available space, size of preferred strawberries and how much work you want to put into the strawberries. June Bearing, mid June, strawberries produce a nice, large and sweet berry. Because they only produce for 2 to 3 weeks, there is not so much work to take care of them. You do, however, need space because of the many runners they produce. They are classified into early, mid-season and late varieties. Chandler, large, high yield, large quantities of small fruit later in season. Short day, Camarosa is large. It can be picked when fully red though it isn’t ripe yet – good for commercial shipping, and still have a ‘long shelf life.’ This variety represents almost half of California’s current commercial acreage. Short day, Oso Grande is a firm, large berry, with a steadier production period than Chandler. Do not plant strawberries where tomatoes, potatoes, peppers or eggplant have been grown in the past four years, because these crops carry the root rot fungus Verticillium which also attacks strawberries. Pine needles are perfect mulch for strawberries, since they like their soil slightly acidic. The short needle type is easier to place among your plants if you didn’t lay it on before you planted. Though strawberries like well manured and composted soil, no overfeeding! You will get magnificent leaves, lots of runners, less or no fruit. If you unknowingly make that mistake, water like crazy, maybe a good 45 minutes, 2, 3 times over the period of a week. Rain and watering leach Nitrogen from the soil. It is said to get the most berries, remove the flowers the first year, letting the plants get established. The second year plants produce the most, third year production tapers off. I don’t know anyone who removes the first year flowers! It is just too tempting to simply eat the berries! Commercial growers replace their plants each year. And how many seeds does the average strawberry have? 200! And can you plant them? You betcha! Strawberries are kinda like natural seedballs. The easiest way to plant them is to just throw the bug-eaten or overripe ones where you think you would like a plant to grow and let them lay right there on the ground. Nature takes over. One day when you have forgotten all about it, there’s a strawberry plant!